Today I’m linking up with Gussy for her weekly inspiration workshop! She’s an incredible inspiration to the blog community and brings such ruffled goodness to everything she does. This weekly link up is a fun community building opportunity that I’m so excited to participate in! 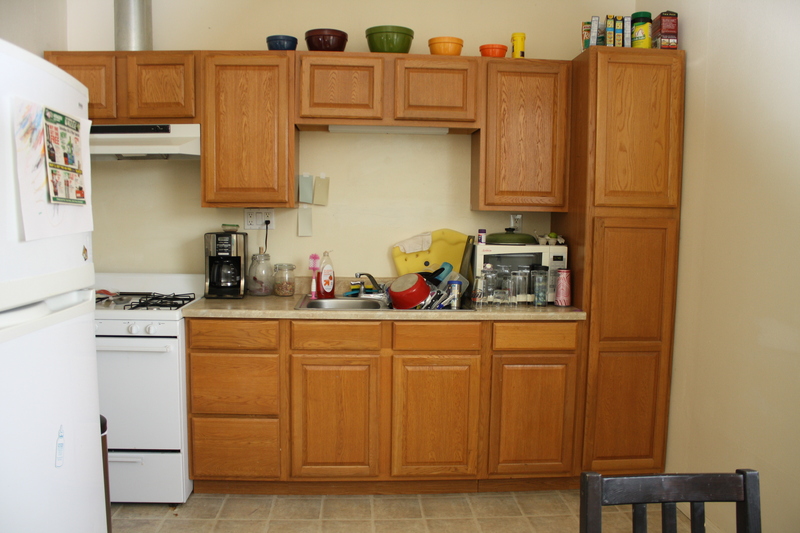 This week’s prompt is Kitchens. Our kitchen is currently in the “much to be desired” category. It’s sadly lacking in counter space, cabinet space, and overall aesthetics. We’re renters….but I’ve got big plans to add some form and function to this boring and sad little space. Here’s our kitchen on a bad day (by bad day I mean a day where my entire day was spent cleaning up bodily fluids from the tiny humans that live under my roof). I can’t believe I just posted that photo to the internet… this is a great exercise for me to overcome my OCD tendencies about my house being perfect before I share it with anyone. Here’s my inspiration image, found via Pinterest, originally from House Beautiful. I adore the crispness of this kitchen. The sleek white monochromatic pallet makes my heart pitter patter. I love the chic chairs in glossy black and the country charm they bring to the room. Now I’m just itching to get started on our kitchen! I adore your dream kitchen! The backsplash is amazing and the contrasting, black chairs…to die for!